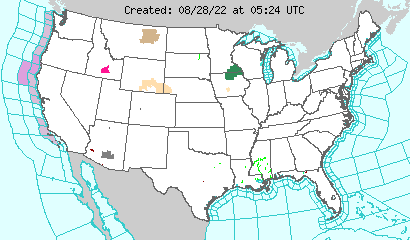 The National Weather Service produces a Watch, Warning, and Advisory map that shows currently active weather warnings, watches, and advisories throughout the U.S. Please note that map will only display the most severe weather advisory for your area. To see a list of all weather advisories currently affecting your area, click here. This map is updated regularly as new information arrives. The NWS Storm Prediction Center provides a simple map of severe thunderstorm, tornado, and flash flood warnings in the U.S. This map is updated regularly as new information arrives. The NWS Storm Prediction Center provides a real-time image loop of severe thunderstorms throughout the U.S. These images are updated continuously. This National Weather Service map shows the current weather forecast for the united states. These weather forecasts are produced every day. NWS now provides live web feeds for all weather watches, warnings, and advisories in your state. Even if you do not have a Live Feed Reader, you can still use this site to read the current weather advisories for your state or county.